There appears to be a universal consensus that the “zone”-the mind-body connection that invariably produces our best and most relished performances-is, for most of us, an elusive place. In fact, the harder we try to “get there,” the less chance we have of arriving there. So, this precious state has become more of a random experience for most athletes. They simply don’t have the tools and ability to focus on the task at hand. Based on my experience, I believe the crux of the problem is we are all far too much in our head, focused on the result of our shots-missing, looking foolish, losing, even winning–and too little in our body. On average, we tend to operate in a left brain society-thinking and solving our way through the day-while the zone is actually a balance between the left and right brain (creativity, intuition). The net of this is that we are seldom in the moment because we are processing all the time; analyzing and projecting into the future-“what if I win or lose, why isn’t my serve working”-which are usually thoughts that are the kiss of death in competition. This pattern of processing has become habitual for most of us and learning to let go, control less, embrace the moment and be challenged by whatever is in front of us need to be more incorporated into our games and lives. Looking back to a past match on the pro tour in 1991, I remember playing on stadium court at the Longwood Tennis Club against Martin Wastenholme (#90 in the world at the time). I won the first set 6-2 and was playing in a “state” I believed to be reflective of the zone. So, there I am. It’s break point and I feel this tension creep into my arms and shoulders. At the time, I remember telling myself to “relax.” Well, as you might imagine, I got tighter. Patrick Rafter did the same thing three years ago at Wimbledon. After losing, he said, “Next year I think I’ll tell myself to get tighter and see what happens.” As you will see, this is not the answer either. But the fact is, reaching this state of mind-body doesn’t need to be such a mystery. Second, both Rafter’s reaction and my own were attempts to calm our bodies with a word, which is usually ineffective. Rather, what I needed to do in the moment was to let go of the tension-that is, allow it to release by simply watching it and not fighting it. When we are truly aware of the tension and don’t try to control it so much it usually begins to subside. What both Rafter and I really needed was the ability to “call up” a feeling of looseness or use a visual that would have a kinesthetic impact. This comes through self-awareness on and off the court and paying attention to what loose and tight actually feel like. So, what happened to me here? And what presumably prevented Rafter from reaching the zone in the Wimbledon semi-finals? First of all, speaking for myself, I was too focused on outcome, which is what got me overly tight in the first place. My mind went to the thought that I had just won the first set, which caused me to project into the future. Very quickly, I lost the same level of focus on the task at hand, namely the point, the ball, confidently pulling up visuals of what I needed to do in the moment, and just being instinctive. On the court, putting ourselves on the line, with energy pumping through our veins is hardly the time to talk your way into the zone or out of an uncomfortable place. Though powerful “cue words,” if believable and highly meaningful to players, can open the door to a physiological response, getting into our body on demand by accessing this state on a synaptic/physiological level that is far more effective. So, how do we do this? To see for myself how this “training” might be done I decided to explore biofeedback before the men’s 35 World Championships, a procedure designed to teach the kind of relaxation and focus I’ve known on my best days. Here, a practitioner connected electrodes to my scalp, fingertips, chest and arms, all of which monitored my heart rate, blood pressure, skin temperature, and muscle tension to the point where I felt like a human test subject in a laboratory. I also had a gigantic monitor with a graph and speakers in front of me, which elicited sounds and visuals to provide me with feedback when I was accomplishing my goal-namely, to become calmer and more relaxed. You can imagine how my heart began to beat faster as I witnessed my entire being on a screen in front of me. Within minutes, through diaphragmatic breathing (from the stomach) and dropping my mind down into my naval area like an elevator over and over (which is called centering in sports psychology), and giving up any tendency to control the situation, I did begin to relax-considerably. The most fascinating part of this experience for me was the difficulty in still staying focused on my breathing and centering my mind when I was given positive feedback, that I was achieving my goal-you know the result of my effort. At first, being the performer that I grew to know of myself over the years, and wanting to be a great subject, I tried to focus harder because I wanted to do even better, to overachieve and be the most relaxed subject he’d seen in years. So what did I do? I started to control the situation more by forcing it. It’s a subtle reaction, this tendency to force and control, which is the same tendency we feel in matches when we attempt to guide our shots and try even harder. But, here, as soon as I reacted in this way, the noise became louder and the graph on the monitor would shoot up, signaling to me that my heart rate and tension were rising. So, within minutes, I began to learn even more how to keep my attention connected to my breathing and let go of my desire to control and do even better even though the result of this level of relaxed focus was being consistently fed back to me with sounds and pictures in front of me. Once again, I witnessed the power of process-focusing on my breathing, moment by moment, and away from the outcome. Once players got beyond the initial performance anxiety of having their body hooked up to a machine, many were able to ease themselves into a deeper “zone-like” state by focusing on their breathing, pulling up positive memories and experiencing the feeling of letting go. With their finger in the sensor, I would notice their initial unease shift to one of peace and serenity as they pulled up positive memories and focused on letting go of their tension. Gradually, I would see players begin to smile more and relax into their chairs. When they came out of this 5- minute exercise they seemed calmer and more connected to themselves; to an inner energy source. They were simply more present. This feeling stays a mystery only because we haven’t been able to generate this calmness at will in the way Freeze-Framer or traditional biofeedback offer. Also, our lack of understanding of what this recipe of relaxation, focus and intensity feels like and a commitment to training this cocktail of emotional experience consistently on and off the court keep most of us from being able to replicate this mind-body state over and over. The key is to get yourself more connected to your body by shifting your attention to your heart and train yourself to let go of tension on demand with your breathing. Having trained myself to breathe throughout the day in a relaxed way over the past 6 years, I, too, was able to relax on demand, literally. The difference in being relaxed and experiencing the relief of letting go in this way, and truly know what this feels like has great promise for those of us who experience tension in match play. The relaxed, calm body coupled with some intensity (positive energy) and more pin-point focus on “relevant” cues in matches-ball, being loose, strategy-are the ingredients of the “zone” we all experience from time to time. Once we improve our ability to stay present and away from outcome, I believe we are more than half way home to experiencing something close to the zone on a more consistent basis. The next half, which may be the easiest part in many respects, is to get familiar with the feeling of trusting our shots, letting go, and knowing, on a physical level, what it feels like to truly be loose and “free, which can be achieved by training yourself the way I’ll describe. Using a scale of 1-10 to monitor this on the court can be extremely useful to check in on an ongoing basis throughout the day or match (10 being extremely tight and 1 being extremely relaxed). Find out where you feel most comfortable on this scale. Personally, I like to feel about a 5 or 6 in terms of being physically relaxed. When I get much higher than this I become more conservative and make more errors. The prospect of hooking ourselves up to a monitor (Freeze-Framer or traditional biofeedback) and seeing the results on the computer can be extremely powerful. After all, as humans we love to see the “fruits” of our efforts. If our ambition shifts to the process-to being as present as possible-we are far more likely to experience the peak moments we are actually wanting anyway. This is the great paradox. We seek winning and avoid losing yet it’s the satisfaction of playing well and going for our shots that we want, even more than the results, which tend to fade after a very short time. So, the more familiar we become with the positive feelings, the more we increase our self-awareness, and the more we stay engaged in what we are doing in the moment, our most treasured moments in the game will be available long before our results are even posted. For more information on the science of Freeze-Framer, click here. To purchase Freeze-Framer, click here. 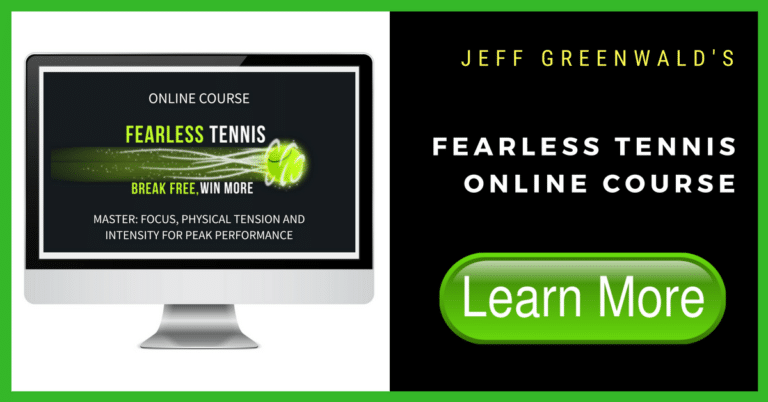 Focus your attention on “relevant” cues-ball, breath, strategy-and away from the match outcome. Use an image of yourself being relaxed, watch tension release simply by focusing your attention to the tense body part as opposed to telling yourself to relax. Experience the feeling of letting go by focusing on your breathing and focusing your attention on your heart area. Let go of controlling your shots. Trust them to happen. Don’t force it. Train the feeling of being relaxed on and off the court by using deep, diaphragmatic breathing and centering your mind into your navel. Connect more to your body on and off the court. Use a scaling system of 1-10 (10 being extremely tight, 1 being extremely relaxed) try to notice the difference in your tension level, particularly when serving and returning.